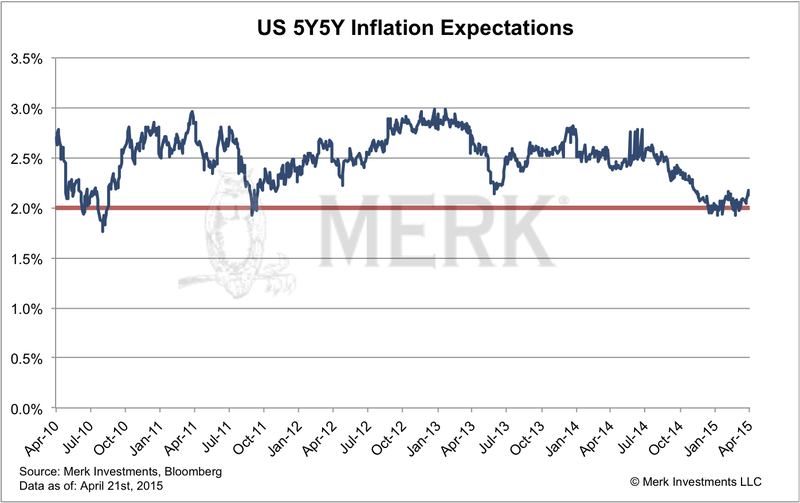 Merk Insights - What's next for the U.S. Dollar and Currencies? In anticipation of higher U.S. rates and lower rates elsewhere, the greenback had enjoyed a dramatic rally. Has the tide turned, or is the dollar merely taking a breather? We believe there are threats and opportunities hidden underneath recent market action. Below is a closer look in an effort to allow investors to better understand the dynamics that might be unfolding. In the Eurozone, Draghi raised alarm bells as some measures of future inflation expectations dipped below the ECB’s target of “close to, but below 2%.” The plunge in commodity prices exacerbated this decline. However, it was what I would call a convenient excuse to announce QE. 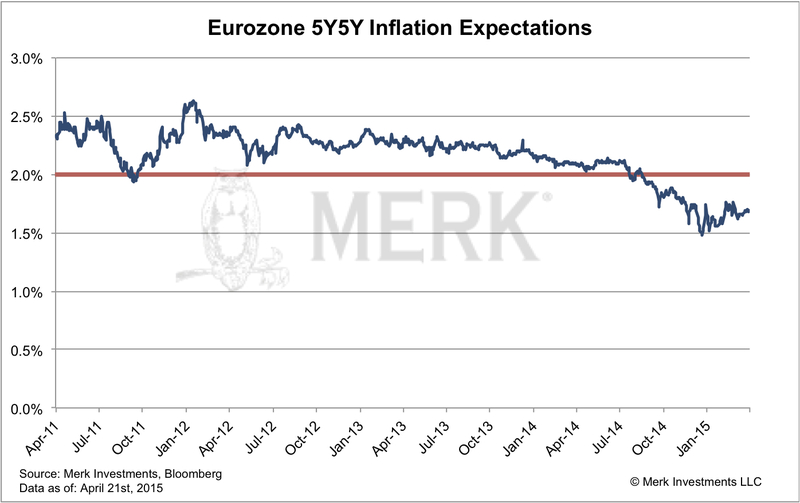 The context in which Draghi presented it suggested he targeted the exchange rate as a way to induce inflation. The logic he presented last summer stipulated that weaker Eurozone countries must become more competitive; as achieving greater competitiveness through lower wages has a tremendous political cost, the better alternative may be to increase competitiveness through a weaker euro which – incidentally – may also help boost inflation. However, I would like to point out that the chart for the U.S. above shows a picture that isn’t all that different. When Bernanke was at the helm of the Fed, he would announce another round of QE when forward inflation expectations on the chart above were coming down towards the 2% target. But instead of talking about QE, we were told to be patient, as the recovery must surely be under way. In fact, for those that haven’t noticed, the U.S. has not raised rates as of yet. But we have been told over and over again that the U.S. is on its way of raising rates. This chart shows that we reached extremes, with the market suggesting a meteoric rise of the U.S. economy while the Eurozone and the rest of the world crash and burn. In many ways, this is a symptom of the types of markets we have experienced with ever more people jumping on the same trade. In fact, in just about any asset class, it appears that investing based on momentum has been one of the more profitable strategies. However, be warned: in our analysis, asset bubbles tend to be popped after too many people have piled into the same trade. In this context we think stocks, bonds and the dollar are all vulnerable. 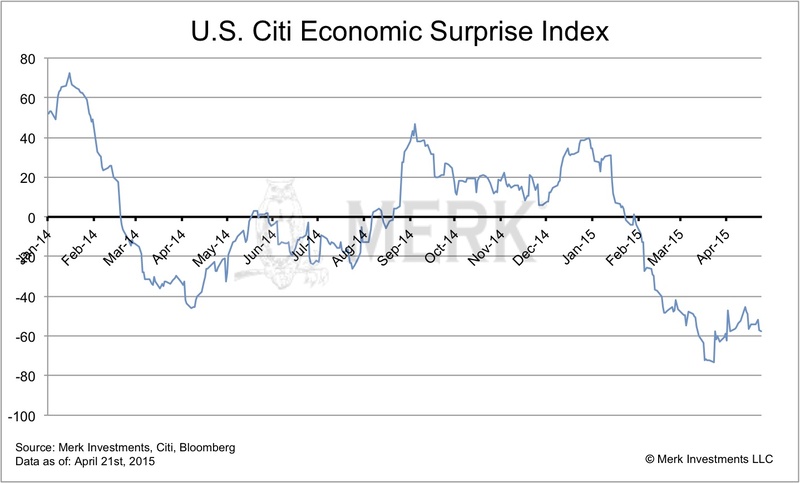 With regard to the U.S., this index suggests things might be developing worse than anticipated. Conversely, in the Eurozone, the economy may be developing better than anticipated, although that drop in the last data point is a reminder that one has to be cautious in interpreting too much into shorter term trends. Still, to us, it drives home the point that the market got way ahead of itself. As such, the sharp bounce in the euro off its lows can be explained by profit taking, a short squeeze, and a re-pricing of expectations. 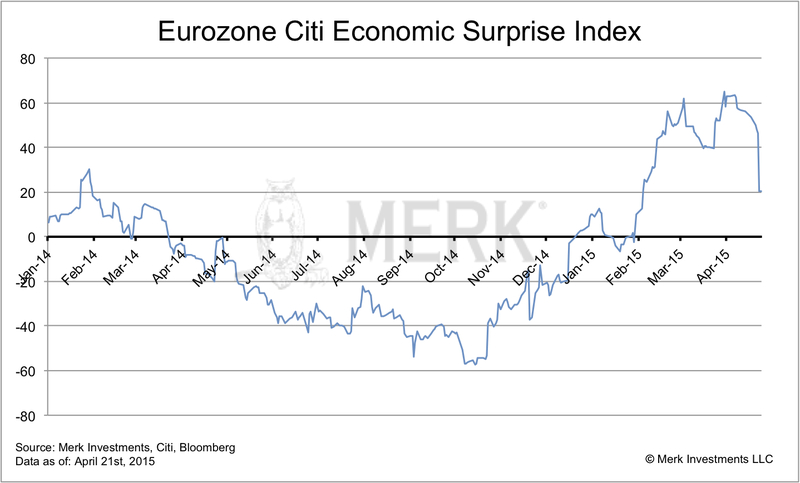 But is it a dead cat bounce for the euro, or is it a sign of other changes to come? Many say Europe is pretty messed up. That may well be, but isn’t much of the world messed up? Even back in the U.S., don’t we have our share of a “mess”? Furthermore, does anyone really believe Greece, or, for that matter, that China, Japan or the U.S. would jump over its own shadow and adopt a different culture? Our view is that changes will happen, but always in the respective cultural and political context. As such, to continue using the eloquent term: Europe has always been a mess and will likely continue to be a mess. And in the U.S., we are unlikely to address the sustainability of our entitlement obligations anytime soon. And Japan won’t be able to find a way to move towards what we may deem sustainable deficits anytime soon, either. In our assessment, the real question investors should ask themselves is: what is the relationship between a company, or currency, versus the market value/price. There are great businesses, but they might be overvalued; similarly, the greenback may have a few things going for it, but is what appears to be an ever-stronger dollar justified? 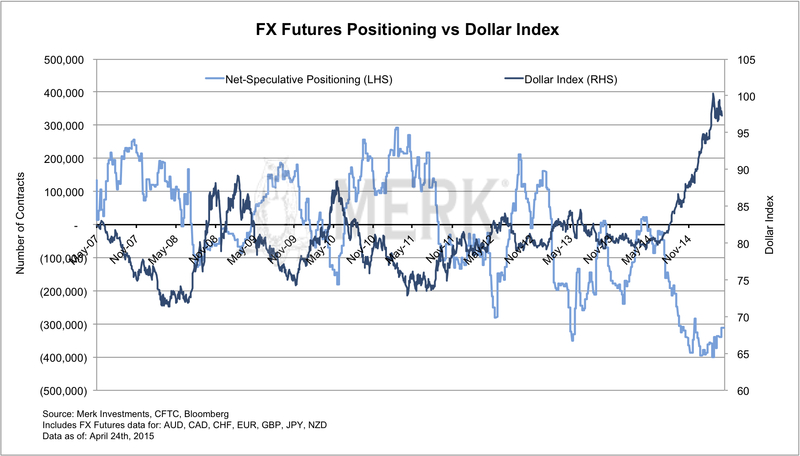 The force acting against this is speculators that continue to have dramatic short positions in the euro. Those bears are unlikely to leave without a fight. Note that I carefully wrote that the “threat of contagion due to a Greek default has diminished.” As such, I consider a Greek default one of the better outcomes for the euro. At the other end of the spectrum would be significant debt forgiveness without anything in return. This “easy” path out would encourage other weak countries to follow suit and may cause havoc in the respective bond markets that, in turn, could make the euro the favorite place once again for investors to express their dismay. As such, it is important to continue monitoring how peripheral Eurozone debt trades for any spillover effects. While much attention has focused on the euro, commodity currencies, such as the Canadian Dollar, Australian Dollar and Norwegian Krone suffered rather substantially as the price of oil was plunging. Similarly, they’ve had a bit of a comeback since oil prices have rebounded. Just about anyone who has tried to forecast oil has been wrong over the past year, so I’m not going to throw out a price target. However, what we do know is that access to credit to smaller players (the fracking industry mostly has small players) has become far more challenging. Similarly, anyone with a high cost of doing business (this includes the oil sands) may continue to face significant challenges. We also know that storage bottleneck has not been fully resolved. As such, challenges remain. Of the currencies mentioned, the Australian dollar may be least dependent on the price of oil; Australia’s economy is very much dependent on iron ore and other hard commodities, notably exporting those to China. As such, the Aussie has often been considered a proxy for the health of China’s economy. What we see when we look at the Aussie is a central bank that has been desperate to weaken its currency. In its most recent statement, the Reserve Bank of Australia (RBA) tried to talk down the Aussie yet again, writing: “Further depreciation seems both likely and necessary…” Yet the currency rallied on the RBA’s decision to cut interest rates to 2% (yes, there’s a central bank that’s not at zero!). And yet, they decide that more QE is going to be undertaken. On April 29, when the above press release was issued, the Swedish Krona surged over 2% versus the dollar (and almost 1% versus the euro). The reason? This much hogwash was too much: those “low” inflation numbers are based on headline inflation that includes energy prices. And while those have plunged, the year-over-year drops are going to phase out starting late summer. That is, the one excuse, low inflation, will be dropping by the wayside. As such, we believe the Swedish Riksbank, more so than many others whom might still have the excuse of a weak underlying economy, will have to do a U-turn on policy. So where does that leave us? Later this summer, various central banks may have to start back-peddling on their ultra-loose policy as inflation is inching up yet again. At this stage, the ECB is shrugging off calls for a premature ending of QE; the reason is obvious: QE is less aimed at inflation, and more at inflation expectations. As such, if there wasn’t an “absolute” commitment to printing money, the fear may be that inflation expectations plunge right back down. As such, expect mostly dovish talk, then a change of heart that might come rather suddenly. 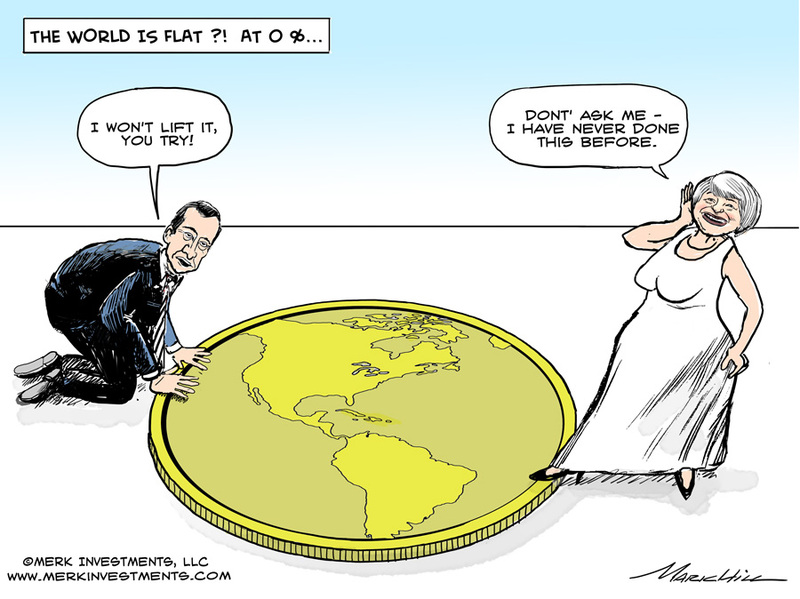 We haven’t talked about the UK today, but Bank of England chief Carney is the master at turning on a dime, pardon, penny. Except that in the UK, economic headwinds are actually increasing; their economy, very much dependent on housing, is also vulnerable due to Russian sanctions as oligarchs are no longer gobbling up London real estate (London real estate was long considered a ‘safe haven’ for Russian money). In the U.S., we might see our first rate hike later this year. But the question will be how much is priced in already and what will be the rate path? First, the old adage that markets can stay irrational longer than investors can stay solvent still applies. Momentum based bubbles can take on a life of their own, as the tech bubbles in the 90s and housing bubble last decade showed. I would add to that the 35-year rise in bonds; and also what appears to be a relentless rise in stock prices currently. When the tide turns, don't think you can time it right. Don’t count on a government bailout, either. Investors may want to consider true diversification to be ready when the tide turns. But that’s not so easy when lots of asset classes have been rising in tandem. Even in the currency space, where we so often praise the merits of diversification, be careful: some of the more successful currency strategies in recent months have been based on momentum. Should risk sentiment change violently in the markets, many of these strategies that appear to provide diversification on paper may all falter at once.